A useful guide, this down-to-earth textbook is an excellent supplemental tool for aficionados of the dramatic arts. Groundbreaking theater and the fruits of a loving, collaborative partnership that spanned twenty-four years fill the pages of this touching tribute. Kathleen Keena chronicles her accomplishments with husband Clark Bowlen until his death in 2012. The Play’s the Thing is a fascinating behind-the-scenes look at stage performance from set design to stage production. Backed by an extensive bibliography as well as two appendixes, and illustrated with numerous black and white photographs, this analytical reference book explores academic, community, and independent productions. Divided into five chapters and packed with twenty-four summaries that delve into plot, structure, acting, and challenges associated with implementing these elaborate plays, Keena describes dramatic creation from the standpoint of an innovator. Evident in her narrative is the dedication and passion that fired her desire to find new methods of presenting a familiar work while remaining true to the original playwright. What cannot or should not be changed is left alone, yet the result of Keena’s and Bowlen’s joint efforts defied convention. Though marketed as literary criticism, the book is a biography of Bowlen embedded in an educational text on the performing arts. Interspersed with artistic evaluations are Keena’s impressions of her partner’s ideas and techniques. She integrates bits and pieces of their professional lives together, providing details that enhance the scholarly nature of her writing. Clark designed a set that emotionally expressed the content of the show. He stretched reflective material across three panels to represent the Wall, and when the structure was lit, the actors facing the panels were in sightline of the audience. Clark built the set with the idea that we would travel it, and we—the veterans, Clark, and me—mounted the installation and broke it down at each site to provide symbolism. Conversational yet informative, Keena’s relaxed style explains complex, inventive approaches without forcing an unwelcome immersion in pedantic jargon. A useful guide, this down-to-earth textbook is an excellent supplemental tool for aficionados of the dramatic arts. Tennessee Williams and William Shakespeare, Oscar Wilde and Eugene O’Neill—outstanding writers, all—yet it is the interpretation of their scenes that brings to life the famous characters they created. Deep inside the heart of the designer, the director, the producer, and the actor resides the spiritual fuel to energize every set with emotion that reaches the soul. The author has performed and directed theater since 1974. 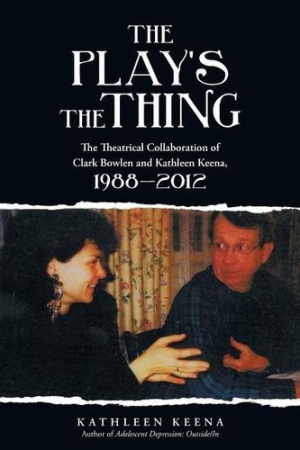 The Play’s the Thing is her second book, a documentation of an imaginative journey and a beautiful accolade to Bowlen.